Four people were taken to hospital Tuesday afternoon after a two-vehicle crash on Portage Avenue at Maryland Street. A Chevrolet Venture minivan sat on its roof near the scene after being involved in a collision with a Nissan SUV. The Nissan came to a rest on the sidewalk with both of its airbags deployed. 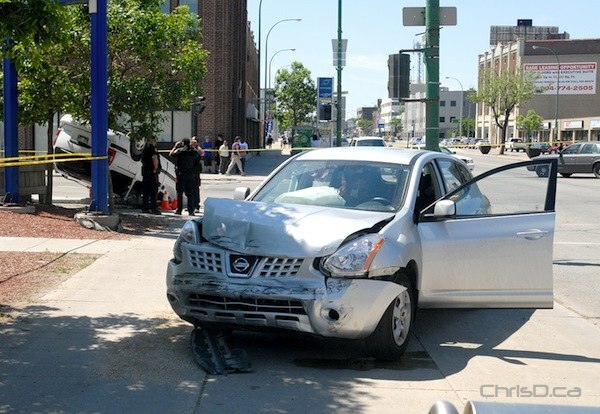 Winnipeg police said numerous people were injured in the wreck, which happened just before 1:30 p.m. Eastbound traffic on Portage Avenue is being diverted onto eastbound Broadway from the intersection of Portage and Broadway. Westbound traffic on Portage Avenue is being diverted northbound onto Sherbrook Street at the intersection of Portage and Sherbrook. Southbound traffic on Maryland Street is being diverted westbound at the intersection of Maryland and St Matthews Street. UPDATE: 5:15 p.m. — Roadways in the area have since reopened.